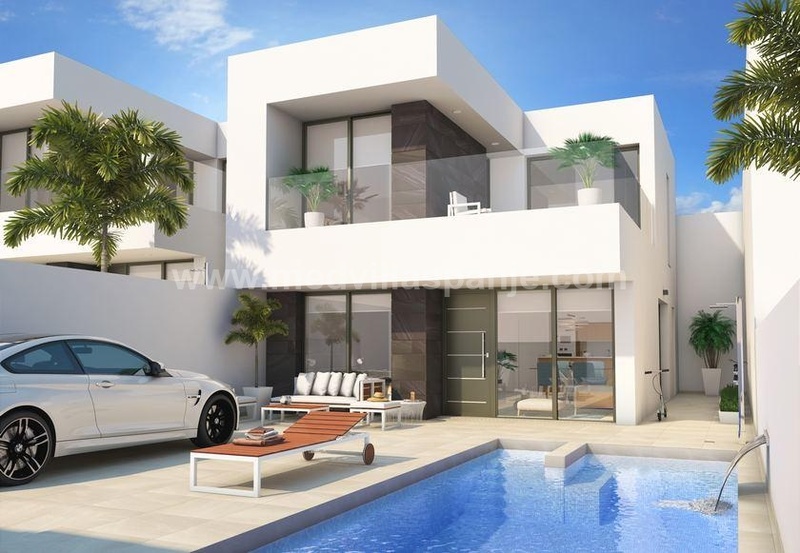 New villas for sale in Spain near San Miguel de Salinas & Villamartin, Orihuela Costa, Alicante, Spain. This new small-scale allotment will consist of only 2 villas of 2 floors each. Each house has on the ground floor an entrance hall, spacious living and dining room with open kitchen, 1 bedroom with fitted wardrobes and 1 bathroom. The first floor has a night hall and 2 bedrooms with both their own bathrooms. The master bedroom also has a private terrace. The upper floor is fully equipped as a roof terrace. Each villa stands on a private enclosed plot with a beautifully landscaped garden, a parking space, private swimming pool with lounge area. The domain of these modern villas is located 4 km from the beach, in the beautiful surroundings of the Natural Park of Laguna Salada. The area around Guardamar del Segura is famous for its sand dunes and pine forests. At 1 km we find all amenities such as cozy bars, restaurants, shops, etc ... back. Alicante airport is only 30 minutes away by car.